Why does wine have sulphites? A great viewer question! WineScribble answers questions about sulphites in wine, wine sulphites allergies and side effects, and the big one: the wine sulfites headache. And stick around until the end to find out if white wines contains sulphites too! What on Earth are sulphites and who put them in my wine? 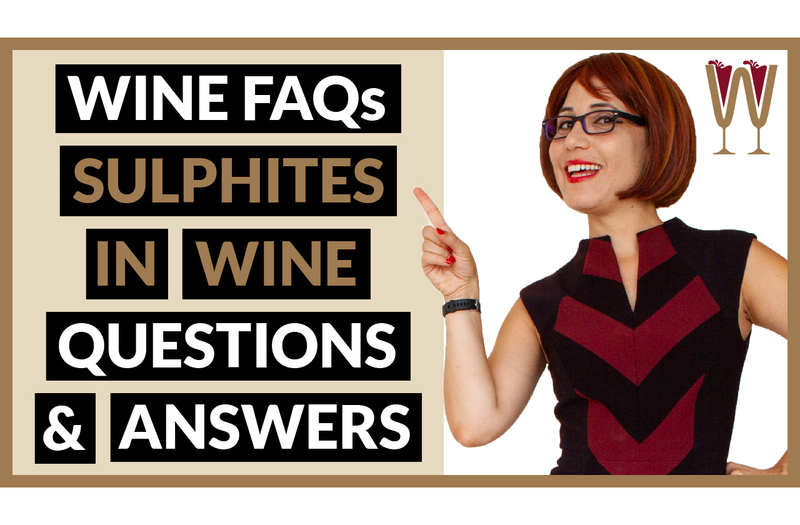 I thoroughly enjoyed researching this topic and can’t wait to share with you all the interesting information I have found out about sulphites in wine! And stick around till the end for a bonus tip about the infamous red wine headache and its presumed connection to wine sulphites! So, what are sulphites? And what are they for? Without sulphites wine would last no more than six months – and that’s provided it was kept under perfect storage conditions and was not transported far. Wine sulphites are antioxidants that are added to food, including wine, to preserve colour and extend shelf-life. They prevent the development of fungi or bacteria and protect wine from oxidation. But wine is as old as civilised society. Why start adding preservatives now? Right? Wrong. For one thing, not all sulphites are added. Sulphites are created as a byproduct during the fermentation of yeast, so no wine will ever be completely free of sulphites. Wines have always contained some naturally occurring sulphites. A sulphite-free wine still contains some sulphites, but less than the legal limit of 10 parts per million. The fact is, due to better sanitation methods and greater temperature control, winemakers nowadays use far fewer added wine sulphites compared to the past. Are Sulphites in Wine Harmful? But I guess, the real question on everyone’s mind is, are sulphites harmful? By the way, Tasters, if you enjoy our videos, don’t keep it to yourself. Hit the Subscribe button and the notification bell. Get our content first and never miss a thing! Consuming wine sulphites does not generally cause any harm. An adverse reaction is more likely if the consumer suffers from severe asthma, lacks the necessary enzymes to metabolise sulphites or happens to have a particular allergy to sulphites. Only 5 % of asthma sufferers and less than 1% of the general population are likely to present an adverse reaction to sulphites. It is to protect this very small percentage of people with a sensitivity to sulphites that the law requires the phrase “Contains Sulphites” appear on the back label of the wine bottle. Or is it the front label? If you want to know which label on your wine is actually the front and which the back, watch our video on bottle labels. I have left a link in the Description below. And now for my bonus tip: is it true that wine sulphites in red wine cause the infamous red wine headache? Well, no. Not at all, actually. Sulphites in wine do not cause headaches. More likely culprits are the tannins, histamines or the alcohol itself. In fact, if white wine does not give you a headache but red wine does, that’s a definite sign that you are not allergic to sulphites. White wines, which contain no tannins or lactic acid to help preserve them, require far higher amounts of sulphites than red.